Many of my friends ask me, “How old are you Santa Claus?” I also hear people whisper, “Is Santa Claus old?”. “How old is Santa Claus?”. “What age is Santa Claus?”. Or, “When was Santa’s birthday?”. I laugh when I hear them whisper “How old is Santa Claus?”. After all, I may be very old, but I do have very good hearing! Ho! Ho! Ho! I guess I better keep my whiskers. Otherwise, I won’t be able to say that any more! Ho! Ho! Ho! Sometimes, to keep people guessing, I also say I am as old as my tongue and a little older than my teeth! Oh, those elves are so silly! P.P.S. My Grumpy Elf now has a whole web page answering “How Old Is Santa“! santa is real my mom told me all of you…he is true!! be kind and merry christmas!!! It says on the site and google that Santa is 1,748 years old. I’ve heard Santa is 1’747 years old, but I don’t care if he’s a little old, he’s kind and thats why I love him! Don’t get me wrong where I’m beginning to believe in Santa Claus again and he is definitely real…but also read the stories about Saint Nick and Saint Nick was the inspiration for Santa Claus. St. Nick was born in 270 A.D. and unfortunately passed away in 343 A.D. But definitely still lives on in spirit 100% x infinity. And honestly these calculations were not easy where I think Santa Claus is 2,447 years old as of 2018. I did some research into this where 400 B.C. is 400 years before Jesus was born where you would think 1500 A.D. is 1500 yrs. after Jesus was born but it’s actually 1,499 yrs after he was born since A.D. began at 1 A.D. and there’s no year 0. Here are my calculations: 270-1= 269 and 343-1=342. Take 270+269=539 and you also take 343+342=685. You add the two sums 539+685 = 1,224. Then you do 1,224-1=1,223 and then you add those 2 results up 1,223+1,224 = 2,447. Everyone is saying that he is 1,747 years old.But I think Nick “Santa” (Mordern) Claus is 93 years old and turning 94 ,December 31. I think you are 170? Santa you are 1,747 and Miss Claus is 1,735 years old!!!!!!! Let me give everyone a fact about Santa Claus. Saint Nicholas was born in 270 AD. That would make him 1,747 years old. Santa is getting ready for his round-the-world trip. The first Santa was called St. Nicholas but his was changed over the years to Santa Claus. You are 1,747 years old. Hi Santa I think you are 80. Dear Santa I think you are 1747 years old! Hey Santa. Every ones not even close ’cause your age is beyond count. Also if it’s not much trouble could you please get me a pink, fluffy Unicorn for Christmas. AAlso we’ve got a bit of cookie shortage in the house so apologies for not having any cookies out this year. Hi Santa I saw that you did a video for me and my brother. I think it was the best video I’ve ever seen and my brother was so silly in that pepper pig costume. How did you get those photos? I so love you. When you come you will not see me because I’m at mums Christmas Eve. When you come to dads I hope you will like owe Christmas tree and the picture I drew for you. The picture has Rudolph steeling the candy cane from you and flying away with it and he throws it at the other reindeer. The other reindeer dropped it on the floor. Now you can’t eat it but you can eat one off owe tree if you want one. Rudolph said haha. By the way is your favourite colour red? Just guessing. I love you Santa. i thinks you are 1,747 years. Hi santa I think you are 1,747 years old. Dear Santa it is about 10:20 here in colorful Colorado.I personally think that you are approximately 155 years old. I think you are 67 years old! I thing are a 100 years old. Dear Santa, how do you get around so fast? I’m not trying to cheat but i just looked it up and it says Christmas has been around for 7,00 years! that is crazy! I think you are around 6,500. I think you are 1747 years old!!! I THINK YOU ARE THE BEST PERSON IN THE WORLD!!!!!!!!!! I think that you are 942 years old. I am letting you know I’m not going to be here on Christmas day . I’m going to Kentucky ! I’m letting you know so you can find me. Anyway I think your 1,00,12300000000000000000000000000000000000000000000000000000000000000000000000000000000000000000000000000000000000000000000000000000000000000000000000000000000000000000000000000000000000000000000000000000000000000000000000000000000000000000000000000000000000000000! I think you are 89! Hi santa my mum caught you last year and took a photo as she was putting out food for our cats. By the way, I think you are as old as time because you were still around when my great-great-great-great grandpa was a boy and he turned 3040 last week. thank you for helping us out santa. Santa, You must be really elderly*, considering that you have hosted this WONDERFUL holiday for many years. I hope you enjoy delivering many presents this year, as you have in the past. Now matter how old you are, you will always be, The Father of Christmas! Happy Holidays and have a happy New Year! i have not said this twice!!!!!!!!!!!!!!!!!! I think you are 1,746! am I right? I think you are 174, because once I asked you last year and you said you were 174 years old. You could be also be 175. Santa, I think you are 1,617, because you had to be born around the time of Saint Nicholas, for people to be mixing him up with you. Hello Santa, I think you were around in the bronze age! My pets think you created the world! I know you weren’t because you wouldn’t of survived the Big Bang! Wow, gosh! I think you are 1745 years old!!! Ps, Please answer if i’m correct in the next letter i send you! I think santa is 102 years old. Hmmm, I believe Santa Claus is about 114 years old, considering he began giving presents to children in the early 1900’s. (No offense to Sanga claus) I ❤️ Santa!!! I think you are 1,744 years old. I am really grateful for you . Also thank you for all the presents you gave me. You are the most wonderful person thank you for all the things that you did for me. How old you are Santa would depend on how old Christmas is and Christmas is thousands of years old. Hi Santa! I hope all is well for you up there. I know this is a busy time of the year so I’ll keep it short. Please give as much of your love as possible to the children that need it the most. Some children struggle everyday just to live. Let’s help them have a very special Christmas. I just want to thank you for making the children all over the world and made me happy as well, so thank you very much sir.Merry Christmas santa. love, bryce williams. P.S. can you mail me a letter from the north pole.thanks. oh and tell the misses i said hi. I wish for a real doctor’s set with all different kinds of things like all the things that doctors use. I think that your 30 years old. I think that you are 120 years old. And I want a easy bake shop for Christmas, and I want some candy, lots and lots of candy. Merry Christmas. P.S. I’m going to e-mail you next. I think you’re 56 years old. And I like you’re elves, and I’m glad my elf friend is one. Or cookie dough as he’s called. Merry Christmas. P.S. I hope that cookie dough shows me around the workshop. i hope SNOWellf can come soon. i think you are thousands of years old.!!!! i want for Christmas a laptop a chocolate money maker and a pair of roller skates. I think you are 110 years old. Love, Rowan. and how old are your elves?how old is mrs.claus? ps am i on the nice list? Thank u santa for all my gifts last year and I’ve been a really good girl this year and want the american girl doll.the one I want is ivy, thank you santa. Santa I think you are 345, thank you for bringing me all my gifts. Are you a spirit Santa Claus? hi im rebekah and im 8 years old.iseem to think that u could be a 5000 years old,say hi to everyone santa . how old are you? i really want to know. i’m just cereous. I think santa is 4000 years old! Because you have a beard. I know you live in the NORTH POLE!!!!!!!!!!!!!!!!!!!!!!!! hi santa I think you are 93 year old. I think Santa is 550 years old. oh and thanks for all the presents! I think that you are 102 years old. Thank you for bringing me Lanie! well I think you dont have an age because im just guessing. Hi Santa I think you are 200 years old! Love Lilly me I’m five year old! are you going to give me a present out of my balcony and i put a BIG FAT STOCKING on my door for you to put present and other places that you can put your present.i believe you. can you say to Rudolph i said hi . i wish i could meet you and a reindeer, but my balcony is old so you shouldn’t land it there just for safety.Please don’t put me in the bad list. i made cookies but i ate it but i have chocolate cookies for you to eat . good night to all of your family and you. Merry Christmas. i think ur about 230 years old but man ur working hard!!! your 550!!!!! i just know it thats wen u stoped counting! i like your clothes and your hat! I think you are 1,000 years old and Mrs. Claus is 876 years old. hi I am 8 years old and I think you are 800 years old and now that I side that I want to say that you don’t think you don’t look that old. P.S. Jasmine thinks that Santa is 4652 years old, Taliya thinks Santa is 20 hundred years old, and Jaide thinks Santa is 15!! Sup dawg!! We know your real because you give us presents. Jasmine would like anything Justin Bieber (or Justin Bieber), my own dance studio, and shoes. Taliya would like a doggie doctor kit, a cop car, and a little dog that has a leash with it. Jaide would like a Justin Bieber doll and a red car and a big barbie car. Have a safe trip and enjoy the cookies and milk! I think Santa is about 250.
santa i think your about 1000 years old sorry if i hurt your feelings. i think you are old ! ha ha ha !!! Dear Santa, I think you are 2357 years old!I really want to know your real age though.By the way my brother wants a space station with a rocket.Bye-bye. I am thinking around 210 years old sorry if I hurt you for saying you are very old. I Think Santa is 100!!!!!!!!!!!!!! I visited you at the State Bank in Escanaba, MI. And I like the picture that you gave in the letter that the elfs said to put my adderess on the little card so that you know I was next. And last year you gave me a picture of you that was a nice picture of you to! And I would like to know your adderess so I can write to you to see how you are doing. How is Mrs.Cluas. Why does Mrs.Cluas not let you tell your or her age at all.And it would be nice to know when your birthday is to tell you Happy Birthday!I love you Santa and have a save trip on Christmas Eve! I think you are 96.
i want to now if i am on the nice list? and i think you are 209 years old sorry if i hert your feelings.but I LOVE YOU SANTA AND I LOVE CHIRSTMAS!! how old are you leave a coment. Can you tell me about the elves that live in Dundee and what they like? 19 years old. That is how old I think you are. do you watch neighbours? i do with my older sister and we both think that it is soooo awesome! Hi Santa Claus! I’m a good girl i school and also very nice with my family.I wish a merry christmas for you and your elves.I want for christmas an I pod and a doll .I hope you be able to bring this for me. Do you watch Glee? I do and it is my favoite show. My favorite charictors are Brittany and Emma. i wish i could be on that show. Also all i want is to make my own c.d.or be on broadway. Can you please tell me, only between us, how old you are? Am I on the good list or the naughty list? Thank you santa very much. santa write back please i like it when i get a letters. Santa, I think you are 2002! Ummm, let me think… 182? I’m as old as my nose and just a bit older than my whiskers! Ho! Ho! Ho! I think you’re 758 years old! Hey Santa. I love you. I think you are 567 years old. I hope I am right. Also, I will mail my list to you. hi! I know you are older than 550 years old. I read it on a different tab. Hello Santa , I wanted to tell you that I think you are 1053,is that right? Thank you for always bringing me presents..love you Santa! Hi Santa! Let me guess… you’re about 1,500 years old? I Really want Action Replay 4 DSI this Christmas if it’s possible. hi santa claus how are you i cant wait for christmas eve and christmas morning this year will you come to my house on christmas eve night while we are all sleeping then we will wake up christmas morning and we will sing happy birthday to jesus and then we will open presents under me and my family’s christmas tree right and my grandmother will come over and my uncle will come over christmas day and we will have a nice dinner a nice roast we will track you on Christmas Eve ok.
1600 thank you for presents christmas aint about getting its about giving. Well, I am 99.99% sure that you are 1663.
hey i think your 34 you look like it and please replay. i have made a list for u when u come to my house the things i really want are starred. and no offence but i would think you are like 1000s of years old. if you are you look really good.maby its because your magic. I think Santa Claus is maybe about 100 or maybe even 150 yrs old…. P.S I WAS CHATING TO YOU EARLIER ON EMAIL SANTA FOR WHAT I WANTED FOR CHRISTMAS. HI , SANTA I AM GUESSING YOU ARE 99 AND HOW MANY ELFS DO YOU HAVE? I’m guessing you are one-hundered years old. But I don’t mind. I love you Santa. i think you are 109 or 108 but if you think your 20 than you can be 20 years old!!!!!!! how many elfs do you have? were do you get your elfs? who is olive the reindeer? santa really want to know how old you are.i was chating to you earlyer about what i want for CHRISTMAS.but i also want to know how old you are.LOVE SERENA. i really really really really really really really really want to know how old you are. i can keep a secret! did you have a job before this? were you the first person to be santa clause? like did you have a job before this? p.s. can you send me your birthday so i know? Santa, I think you are about… 72 years old give or take some years. you are maybe in your 50s am i right? Dear Santa, I would love to know how old you are. Will you ever die? And, did you have another job before you did this one? Sean would like a Snoopy Sno Cone Machine. Paige would like a Barbie Glamour Jet and American Girl Dolls. i love you. do you get my bake love from megan. I think you are 1000 years old! Please can you reply and let me know if I am right or wrong? I have many more guesses to tell! I think santa is 2.ooo yrs old. Why don’t ou tell anyone! hello im leah ellison.im 13 years old and i hope that u have a merry christmas! i still belive in u.
I think Santa is 989 years old! i think you are 150 years old!!!!!!! Dear santa, you are so so so so nice and cool and awesome.do byou know you come on my favorite holiday CHRISTMAS.yOU ARE JUST EVERYTHING GOOD i love you!!! hi santa you are… 1,cool 2,awesome 3,very nice I hyave more but I dont want to say love u bye!!! Im wondering how old you are. Could you please tell me, because I promise that I will keep it a secret. Will you leave me a note telling me your age? I will keep it to myself. P.S. I love you and I have been trying to be a hard worker at school. i think santa is 99 years old. p.s.that is very old,no affece. My bother Jake just said that you’re old but that’s ok right?I love you with lots of jelly tots!!!!!!!!!!!!!!!!!!!!!!!!!!!!!!!!!!!!!!!!!!!!!!! cuantos años tiene santa claus????? I think you are only 99 years old sorry . Please keep me on your good list. i think you are 567 because you have been santa for a long time. I think you are only 100 years old. i think santa is 123 years old because my great grandmas mom and dad and there mom and dad had christmas when old st.nickalas was young. Santa, i think you are 60,000 million years old. PS. I hope I have been good. I think you are 222! i really do think or ever lasting think you are 999,900,700, 000,000,000,000, 000,000,000, 000,000,000, 000,000,000, 000,000,000, 009,987,897, 789,465,234,734, 468,000,000, 000,000,000, 000,000,000, 000,000,000, 000,000,000, 000,001 years old p.s lay off the cookies dude cause your starting to look sort of round. Santa, i think you are 750 years old! Merry Christmas. PS can you please bring me a lego power miner for Christmas? Thank you. i think you are everlating so you can be as old as you can before you die from eating to many cookies. so 100,000,000, 000,000,000, 000,000,000, 000,000,000, 000,000,000, 000,000,000, 000,000,000, 000,000,000, 000,000,000, 000,000,000, 000,000,000, 000,000,000, 000,000,000, 000,000,000, 000,000,0000 ,000,000,000 ,000,000,000 ,000,000,000 ,000,000,000 ,000,000,000, 000,000,000, 000,000,000, 000,000,000, 000,000,000, 000,0000,000, 000,000,000. Hey old santa how are you? I have seen you and amatter a fact I saw you last year. P.S. It was a completely random guess. P.P.S. Sorry about the age i thought u were at first. I think you are 90 years old. I think you are about 90 years old beacause you have been alive for a long preiod of time. ithink you or 90 years old santa. rite now i think santa clause is 342 years old. we also think that santa will live for ever in every little kids heart forever !!!!!!!!! i thank you are 1400 years old. Dear Santa,How old are you? i want to know how old is santa claus??? … ??? I think Santa is 99. I also wonder how old all of your reindeer are. Have a safe flight! I think you are about four hundred years old. I have no clue how old you are but you are the nicest person on the face of the Earth. I think you are over 150 and my grandfather’s grandfather knew you in 1852. Santa, I think your very very very very very very very very very very old. And you have been alive since the 3rd centurary. So, I would say about 18 centurarys….which is 1800 years. SO YOUR 1800 YEARS OLD! I can’t wait ti’ll Christmas! Camryn knobbe is being noughty because she won’t listen to when I tell her to please stop! hi,Santa clause I think you are 900 years old. YOU ROCK YOU ROCK ALOT!!!!!!!!!!!!!! I think you are 900 years old I love you!! you must tell me were you realy older than miss claus or are you as old as your wiskers. I think you are more than 10000000000000 years old.Can you respond to us please? And can I have a babie doll? I think you are atleast 90 or 100. Because you have been around for along time, but I still beleive in you sooooooo very much!!!! are you 689 years old? I think your 200 years old santa. i think ur in the hundreds or lower. like maybe…… uh………150? i think you are in your 80’s. I think you are 89 well my friend said that i say 88. How old is Santa, and Mrs. Claus… I promise not to tell. MERRY XMAS!! I think your wonderful santa and your as old as you want to be….cause you are magical and wise in many different ways…as for Mrs. Claus she is like my mom who won’t tell her age either….love ya lots santa love Bryanna XXXXOOOO Have a Safe and Super Great Christmas 2009!!! I think you are as old as you feel like. That’s what I think. I think you are… Well, I’m nae sure but I do ken you are quite auld! I think u r 100! I THINK YOU ARE GOING BACK LIKE WHEN HUMANS FIRST CAME ON THE EARTH BUT LIKE WHEN 100 CAME ON THE EARTH.OR MAYBE YOU WERE LIKE A SAINT AT FIRST OR A NORMAL PERSON BUT THEN WS VISITED BY A MAGICAL CREATURE AND WAS GIVEN THIS GIFT. I THINK THAT YOU ARE 85 YEARS OLD!!!!!!!! i think you are in your late fiftys, early sixtys!!!!!!!! how old are you i really want to know. I do that sometimes when I meet a stranger. I would say , “I’m older than my cousin” , if people ask me how old I am and I don’t know who they are. Oh yeah , I just remembered , my little cousin I was just talking about , her birthday is on December 23 , 2009. Isn’t that good? I really wish to see you in real life one day. I and my younger cousin and older cousin always wished that. Santa , can I ask you something? Did you ever came to a house to diliver toys , and a child walked and saw you? Some people think your old but I just think your 56 (at least thats not very old HO HO HO)bye bye!!!!!! Sorry I now how old you are it shows on the computer you are 250 years old and when my mom was a baby then you were 218 years old cool I can’t believe i now that yay!!! Are you 500? Hey and when is you birthday too. hay?? I think you are 40 years old. santa i dont know how old yo are i still think your cool! I think you are 358 years old. I think that Santa Claus is 75 and I also think that you are the most magical person I know!!! i THINK YOU ARE ABOUT 83 YEARS OLD. I think you are 564 years old. I thenak you are 20000000000. I bet he is 235 years old! Thats OLD! I think you are 2009 years old because you have been alive scence the beging of time. PS.Do you think i should dress up like you for my winter consert? I think you are 40,000,000 years old. You are great! I Think Santa Is 999 & I Think Mrs Claus Is 990 If You Are Younger Than That I Am Sorry For Saying You Were That Old !!!!! I think you’re 98, 765, 432, 123, 456, 789, 101, 945, 678, 876, 105, 453,675 years old!!!!!!!!! well its hard to tell how old he is.in christmas books they make him look old like 100 years old mabey 9000000000.
parents are santa people think that but it is not true.i believe in you santa and the elves and raindeer and mrs.clause. I think you are fairly old because i know alot of old people that said you came to them! I think you just don’t get older because you couldn’t stay alive forever!!!!!!! I think Santa’s the best and everyone should believe in you because everyone who says you don’t exist don’t believe in you because you don’t come to them because they’re so naughty! santa claus is 100 years old because he has started giving presents to little kids starting in the 1900’s. i think your as old as the cirmiss haladay so thats about 123458. Santa i think you are something like 50 or 60 !! that is just a guess ofcourse … x . HO HO HO ! HOW OLD ARE YOU i JUST NEED TO KNOW IT OR WHAT YEAR WERE YOU BORN!!! I have no idea how old you are but im just picking any random nuber. Santa I think you are in your 60s you no . I think Santa is 49 I am only 1 year old so I don’t know very much about santa!!!!!!!!!!!! I think you are 66.
i dont know how old, maybe really old because you live 4ever. please tell us how old u are ive been thinking about it when I was a 3 year old its been 7 years now please tell us. NOT OLD AT ALL!! !ILY SN!SC!! I think you still rock however old you are!!!!! If you think about it you are probobly as old as the world but a tad yonger !!!! Very old but I can’t tell you how old. If you were born in the beginning of the UNIVERSE you would be about one hundred million years old. I think you have been alive forever because of your magic and you will never die! you are my idol ,we are your no.1 fan ever! And we think you are 5 because it is sad on you because every one says that your very old but i dont think that!! dear santa I think that youare between 100 and 80 years old but I still like you how ever old you are. I know you are busy so I will Make this short you might not be able to tell me but I would like to know how reindeer fly.please write back. Santa, I think you are 1 years old. Even though you have a white beard and lots of wrinkles, you are like a baby. You give and you give, just like a baby does. I LOVE YOU SANTA! im sorry but i think your like 200 or 300 years old i say this because my parents grew up with you and my grandparents,and my great grandparents and so on so on.once again i am sorry but its the truth. santa i think your 100 years old becuase you lived so very long . santa I don’t know how old you are but I think you are about 68 years old. Ok, Realistic now.Id say you’re about 1700-2000 years old… Because in my history book it said St Nicholas was born around 100-300AD, as a nobleman. I think you are about 70.But you look like you are 20 years old. I think santa is actually quite young because he is magical so he can freeze time for him and the world thats why christmas night seems longer because our mind works even though we are frozen in time! I think santa is 91. I say that because my great grandad was 91 and he looked just like you! I think you won’t get any older though because your magic. I THINK YOU ARE ABOUT 150 YEARS OLD. YOU MIGHT BE A LITTLE OLDER! Hmm…quite old? Maybe that would be 74 yrs. old, like my granny Lanas! Dear santa,I think you are 2 million years old because you have been living for a very long time. Hi Santa Claus, I can’t wait until Christmas!! I think you are 93 years old because you have a beard and you kind of seem that old (: Love you! I think santa is in his 70’s. we think that you are 1000 years old. becuse you have delivering presants fora lot of years . I think you are 30 santa claus. I think you’re 500 years old! Am I right Santa?? I think you have no definite age and that you’ll live forever as long as people believe in you. But if I were to say an age I would say you’re probably 70 years old because that’s how old my grandpa is and you and him look alike. i think santa is one year younger then the world. i mean hes benn living quite a long life! I think Santa is very old, but still jolly. He has been giving presents around the world for decades! Old doesn’t mean he can’t be wonderful, magical, and jolly! i think you’re in your late 80’s and i think that you leave me the best presents in the whole world i can’t wait until this christmas you’re the best person in the world. dear santa Ithink you might be over 300 years old dateing way back at the western times the day the north pole was born.To tell you the truth as long as you’re alive it doesn’t really matter and thats the greatest thing ever. i don’t think he is that old for me i tink he is 76and hey that is pretty young. I think Santa is ageless. Just think about how long ago Christmas started. I think Christmas is about love,family and faith. It’s not about presents and gifts. It’s about giving and sharing your afection. I will always belive. Thank you. And Santa will never die. He will only stay alive for many years. You may foreget about him in your adult years, but he will always be here. A little afection goes a long way. Santa is nice enough to make all those toys for all the children of the world. That’s my opinin though. You can think what you want. we dont know how old you are we just like to have it be a mystery. but we will take a guess anyway. my brother thinks your 5,000,00000,00,500. I think your infinity years old. well theres our guesses. I think you are a 140 years old. I THANK you are 88. love you by. You are so obviously one hundred exactly years old. I THINK UR AS OLD AS TIME ITSELF.IM 11. I don’t know how old you are and I don’t care.All I care about is that you’re a good person and that you love me and everyone else in the world, even the bad little boys and girls. By the way the santa in MIRICLE ON 24TH STREET says I also say I am as old as my tongue and a little older than my teeth!I love you!!! I think you look like you are 35!!!!!! Dear Santa, I really love you, and tell Rudolph I love him, too! Bye! Dear Santa, it doesn’t really matter how old you are, you pretty much live forever! And one more thing: How did you meet Mrs. Claus? P.S. If that is too personal, then you don’t have to answer! i think santa is older thrn dirt just kidding your only 20,243,900 thats not bad. i think you are about 155. I think your about 1000 years old. SANTA I DONT NO HOW OLD U R BUT IT DOSENT REALLY MATTER BECAUSE I LOVE U ND ALSO U R MY HERO EVERY TIME I ASK FOR SOMETHING I ALWAYS GET IT ON CHRISTMAS SO I NO U R REAL LOVE U!! Hi santa claus!! !I really want to know how old you are!I bet your really old because haven’t you ben around for years is that right?Oh yeah remember me Lauren.You told me that Mrs. Claws loves San Diego!! !I really want to have a pony or a horse!Remember that ponys’ and horses’ are way diffrint!I belive in magic and so I guss thats how you make your Deer FLY!! !Do you really have a Roudoh the raindeer?If ya do please tell me all about how ya got him and starting from the begining.Oh I always wanted to know this.How can a raindeer have a LIGHTING nose.Did you like put a light on him or something?I mean he can possibolly just be born with a LIGHT on him.You would have to have like a circit board or something in his nose.Well gata go…..:D,:) love you. P.S.Please write me back and answer MOST of my (Q).Love YA!!!!BYE!!!!!! santa, iam just guessing but i think ur 68 iam not really sure . santa i know how old you are you are 15657 and i hpe me and my family have a good christmas!! i think about 1,000 or above. i THINK YOU ARE IN YOU SIXTES OR SEVENTES! Santa must be over 100 years old that is very old to me!!! WOW,CHRISTMAS ISN”T FAR!!!! I LOVE YOU GUYS at the NORTH POLE!!!! i think you are 346 years old! just a guess. i love you. thanks for all the presents! No1 knows about how old santa is but anyways i think he is 84?!?!?!? no he is probible 199 years,(almost 200 years) and he’s brithday on christmas and theirs onley 218 more days until he’s brithday and christmas too so what can you do. the girl who is very naughty? i think you are 131.
let me guess you are about 2009 years old. hey santa you look sorta like your in ur 80’s but I think you’ve been around for probably 2009 years. i have no idea how old you are, santa. can you tell me? i promise i won’t tell anyone how old u are. I don’t care how old you are because old eople are nice. Santa can you please tell me how old you are?I will not tell any one!Not even my mom or dad! Before you go over the world does your wife hug you goodbye and give you a big dinner before you go?Im glad Rudolph likes my house.Does he like jESSIE my dog? I don’t care how o;d you are! I’d love you if you were al wrinkley & in your 100’s. You’ll always be the same old Santa! You know, I’m a singer & I’d happily write a Xmas carol just for you! do you know Sophia?well i want an elf like that and her name be Amanda.can i have her sun.march29? I think you are in your 80’s.cuz I see your picuter’s and you “LOOK” a little old. I think you are 254 years old. But no matter how old you really are you will live forever. I believe you have been around all these years since the year Jesus was born so does that make you 2009 years old? Well I think santa is EALLY old NO OFFENCE we still luv u santa! I don’t want to get to high or to low because if i go to high that would be rude so i guess your 5.
what is you parents name. Im Yves Nobles, and I think Your 2008 or 2009.Ho Ho Ho!!! I think santa you are 2009 years old. i say he has been alive since the 1500`s. santa how do you do it? anyway if your young thats great because you will live a long time if your old you will live a long time to because i belive you will live the longest of anyone on the planet earth!!!!!!!!!!!!!! i think u are like over 1000 years old because u have been alive since the beging of time so u r probley really really really old. name all your relndeers ? I think you are 16,000.
i think you look like you are only 45 to me P. I love you Santa and Mrs. Claus and tell all of the Elves I love them too.And i promise I’ll be in bed on time on the night bfore Christmas Eve I raise my right hand to that and I never break promises. Santa is 999999999999 … 88888888!!!!! As long as Earth has been in space!!!!! it doesn’t matter how old you are its that your still living and thats the greatest thing ever!!!!!!! santa i think your already 100 yrs.old. santa i think you are very old (lol) because you have been delivering tons of presents your hole life! SANTA I THINK YOU ARE 50 YEARS OLD BECAUSE THAT IS HOW OLD MY AUNT IS. I don’t know how old you are and it would be realy hard to gusse out of all the #’s to choose from.I’m not mad at you at all for not telling your age becaus if you did that would be disrespecting Mrs.Clause.And we ALL have to be good before Christmas comes!!! Im not really sure how old santa is. It doesnt really matter, anyway. What matters is that he cares for all of us, so thats all i really care about. i am glad to say 700. I know you have been around for a very lond time, probably, more than I can count!!!!!!! are you 1001 years old santa?if you are i won’t tell anyone i promise! i think that santas in his senendes. I think Santa is 550. That is my opinion! there really is no telling how old you are! But since you would have had to be around for all the other little boys and girls and my greeat grandmother who recently died 3 or 4 years ago 🙁 would always tell me stories about her favorite christmas’s and her moms favorite and her grandmas! So thats atleast 150 years of you living since she was 85 years old 4 years ago and her mom died at 90 so if you add their two lifetimes together you already get 175 so no offence santa but your pretty old! I think Santa is 90000 years old!!!!!!!! Hi Santa, thank for a great christmas!!! are you really old or because your magic your in descise? Santa I dont know how old you are but Merry Christmas. I cant wait to open my presents. I think that you are millions no billions years of age because i have belived in you since i was a baby and i am now 10 yes im older than most kids here but i still belive in santa.So everyone have a merry christmas and a happy new year. I think you are 70 because you dont look that old. I think you are nearly 2009 years old…Haha..
hi santa i think you are 98 years old =^) and thank you for the presents see you tommorow =^)…..
Santa I am going to be really kind and say that I think you are 1234567….. Joke….LOL…I think you are about 67 or younger and if I am wrong then how old are you? I think Santa is 1,000 years oid!!!! i think you are 2 thousand years old well that is what my dad think he is 45,my mum is 36,my sister is 16,my brother is 14 and i am 9. all the best for and be careful when you are driving your slay. 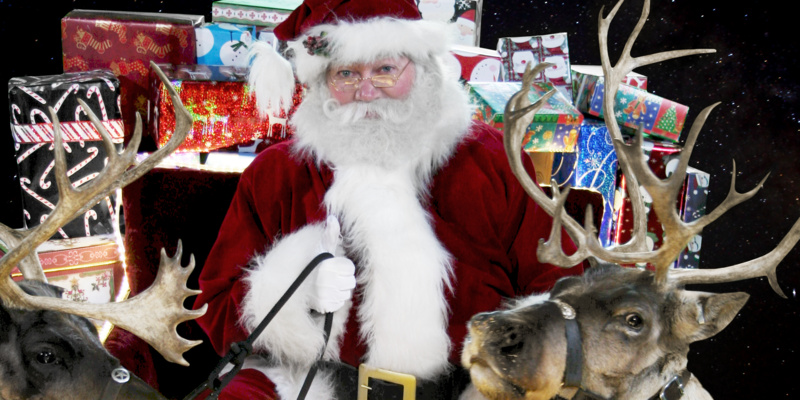 Santa, I would predict that you are in your thousands…..About 5,000 years old? I think Santa Claus is very very very very very very very old!!!!!!!!! … !!!!!!!!!!!!!! Like about 100 years old!!!! I think you are 122! But still young! I think you are 102.
i am just guessing.HO! HO! HO! I think you are 121! i think you are old but wise!!! I think you are 859 years old. We think Santa is about 103 years old. I think you might be about 200 because i know you were around at victorian times and I think victorian times started in 1836…. so about 177! I think you are 3. I think you are 100. I think you are 43. Hi santa claus my brothers are being realy norty my mum says they shold not get any christmas presents. WELL HOPE YOU HAVE A NICE CHRISTMAS!!!!!!!!!!!!!! I heard on norad trakcs Santa that your about 16 centuries old!!! i think santa is ……………………………….. I think that you are immortal because I have asked people and they agree with me. i think you are is 289. Santa is so magical that it doesnt matter how old he is. I wish everyone in the whole world a very merry christmas !!!!!!!!!!!!! Hi santa.Just wondering how old you are. hi santa I’m wondering how old are you? i think you are 11111111122 … 99999999999 !!!!!!! I think Santa is about, maybe 1000. He has been around since people washed thier clothes in the river, and since pioneers were around. santa i know it is a secret right? if people ask you how old you are is that rude? Santa, I am not being silly but I think you are about 40 or 50. I would not think you are about 15000000!!! You are just about the right age Santa. And just the right size for a big hug. you don’t look that old santa!! I think you are 89 not to old and I don’t think you’ll get older you are a Saint! I think you are about in your hundreds because you have been bringing presents to good girls and boys,and coal to bad girls and boys for a long time. I think that Santa is in his 70’s – 80’s. He’s been here for a while delivering gifts.That’s what I think. We think you are 200 years old. Bye! i bet your 132 years old!! Hes probly like 2 years old !! Santa, you have been alive forever. How do i know? Well i just know. MERRY CHRISTMAS!!! santa please tell me how old you are santa whens your birth? to santa i think you are between 30 and 40 no older than that. I think you are 500 years old! My guess is that you are… 999,999,999,999,999,. I think it doesnt matter how old you are. You have done your job as santa very well. But I do think you are very old! No offence! i know how old you are! i googeld it and went to other websites and all of them seid you were born around 1500! yep santa is around 500 years old. wich is very suprising. I think you are 92!!!!!! i think santa is imortal. I think that you are as old as time. i think you are 50 you dont look old merry cristmas. i think you are as old as you want to be at least my grand ma says that. I am not very sure,but i think you are 1,263,458.I said that because you have been alive for a very long time.If i am aloud to say this will you please leave me a picture of you???? santa i think i should still be on the nice list. bye the way i am 20. I think that Santa Clause is probobaly 40-60 years old. i think santa is 78. I think you are 140 years old. P.S. Do you really have whiskers? I think Santa is 150 years old. To tell the truth, nobody really knows exept Mr and Mrs.C. If you count to where Santa was first born (probaly not posabile) but I bet somebody HAS to know. i think santa is 90 yrs old ???????????????? I think Santa is about 800. I think that you are very old. But you are magic and that is why you keep on living! You have been around for a long time! You are the best Santa! I love you Snta. Will you be my bst friend ever? I think you are about , maybe 100 years old. It says that I did a letter but it wasn’t me it was my dad. Santa Ithink you are 71 I am 9 and I still think you are great. 20,0000 years old becuase your history says that you have been delivering presents since 1 A.D.
i did’nt know your older than mrs. claus!! I”M SHOCKT. I think Santa claus is 500 years old just because I have heard stories and from how long the earth has been alive. I think you are 78 years old but i don’t really belive you are even that old. I love you so much but one of the people at my school doesn’t belive in you her name is rachel barger she is in the fith grade like me! I am not sure, but I know you are really old because you have been around for a long time! its over 900000000 but my little pet says he is 9 bad pet! Santa, I think your in your 80’s. merry Christmas Santa!! i love getting stuff from you!!!!!!!!!!! You must be in very good shape for your age. i think you are over 500 years old but you have a fountain of youth that you share with Mrs. Clause and all the elves. SANTA CLAUSE HOW OLD ARE YOU YOUVE BEEN AROUND FOR A LONG TIME AND I DONT NO HOW OLD YOU ARE SO PLEASE TELL ME O PS MERRY CHRISTMAS SANTA! sorry for the meanness of people. Santa I love you but this year when i went to the mall and see you i forgot to ask how old you are.So I think that you are 75 years old. I THINK YOUR 1,000,000,000 YEARS OLD. the elfs and you are the best people in the whole world.work as a team all the time.merry christmas love sam. Soory we missed your birthday! Hope you had a jolly one! I think santa is about 70 yers old. But because hes magical he may be able to live for ever!! Santa is as old as time itself. Santa will never die no matter how old he gets. Not to be mean or anything but I say 300 because Santa has been around for quite some time! Santa Clause I think you are 180 years old. Hey Santa, this is Angela and I think you are like 396 because of a show i watched! Please reply if this close or correct. how old are you really are Santa? i think santa clause is 475. I think Santa is 100,000 years old. I think you are 98 years old. I think he is immortal and is older than most kids and adults he visits. LONG LIVE SANTA! hey holly my name is hollie to but splet differnt. i dont know how old you are but i dont need to! SANTA ARE YOU 45 YEARS OLD? older than my mommy i think………………………………………..
Santa, I think you are 2094 years old. I think this because the first Christmas was in the year 0000 and I think you were 86 when you started. I think you are over 100 years old? santa your at least 2,000000000 00000000000 00000000000 00000000000 00000000000 00000000000 00000000000 0000000000. years old by. i think taht santa is not a human because he has been alive for a long time! who agrees with me? santa what is the truth of ur age? i hope u dont ever die because your my secound FAVOUTE MAN IN THE WORLD EVER !!!!!!!! … !!!!!!!!! I think santa is as old as the earth itself but that dosen’t matter, because you are the symbol of the holadays! I think Santa doesn’t age!!!!! i think you are 68? As old as Jesus.Because you were there when he was born.but even if you are old it is still enough to get you around every kids house on Christmas!!!!!!!!!!!! I think you are 67 and your birthday is March 34th. i think santa has lived about 1005 years but i am still not sure but i do know that santa clause has lived a long long time. santa y-o-u are the best !!!!!!!!!!!!!!!!!! 🙂 🙂 🙂 🙂 🙂 happy faces for you !!!!!!!!!! i love you! go! santa! 150 BECAUSE YOU R SUPPOSED TO LIVE FOREVER! I think you are 190 years old. are you in your 60`s or 70`s bacause that`s what I think. merry christmas also i think when ever its christmasd its santa’s birthday mmmm … mmmm but thats still a guess!!! i think you are about 55 or your in your 80’s!!! I think Santa is 100 every year! !